The Resounding Beat of Our Hearts - Be Strong and Courageous! What an incredible day this must have been, to hear these words shouted out to the doves of Israelites on the cusp of entering God's rest. They had endured years of wandering and suffering in response to the previous generation's failure to trust in God's deliverance from Canaan's residents (Numbers 13). As this current generation now stood ready to enter the promised land, they could recall all of Jehovah's provision and deliverance in the history of their ancestors. Their thoughts of trust and worship in response to God's previous deliverance prepared them for the great step of faith, battle, and victory that lied ahead. Now, they hear God's words delivered through their human leader, as Moses transitioned from being God's earthly shepherd for them, to be strong and courageous in the very presence and enabling help of God Almighty. Truly the beat of their hearts resounded this command and promise as they advanced forward! This truth and the history that was about ready to be made was so important, God mandated that they regularly set aside a time to pass down God's command to be strong and courageous in the context of their promised land entry. Successive generations of Israelites were reminded of their history and their God's deliverance through the faithful adherence to pass this teaching along through this regular 7-year worship cycle. What parallels could we draw from this account in Deuteronomy 31? I don't know about you, but when I read of this account, I am encouraged, convicted, challenged, and drawn to worship! Our innate ability to remember is a gift from God, given to us to recall the past in a way that will help guide our future. I fear in my own life, I miss the blessing of remembering God's past deliverances due to my forgetfulness and failure to regularly recall these periods in my life. May we, God's redeemed people today, do a better job of regularly and specifically recalling God's past work of deliverance and provision in our own lives! May we then be driven to regular worship and bolstered trust in our awesome God! Furthermore, I fear I don't always do my job of passing down stories of God's past deliverance, protection, and provision to my kids. I know this is an area where I continually need improvement. How about you? May we as the body of Christ catch a God-given passion to pass down those worship-infused memorial periods of God's past deliverance. May it be our prayer that our younger generations would grow up fully seeing and realizing God's active work in the lives of their families! Lastly, I am also encouraged, convicted, challenged, and drawn to worship at the reality of walking in step with our awesome God! Although most of us today are not Israelites, we are post-New Testament people of God. We are God's redeemed people who today make up the church. We are God's blood-bought possession commissioned to spread His fame and His message of redemption. We are therefore similarly commanded to herald the awesome work of our God's past deliverance and provision to a world in desperate need of redemption! When the people heard Moses beckon God's sure command to be strong and be courageous in His active work of bringing them into the promised land, think of the confidence this promise gave them. Oh, what confidence we should have in light of our Lord's commands and promises! Let us ponder our God's wondrous work in our own testimonies with His deliverance and grace! Let us allow the words of Deuteronomy 31:6-8 be the resounding beat of our hearts as we advance forward for Jesus! Let us be strong and courageous, for we have God Almighty on our side! He is building His church through ordinary people like us. Let us bolster our confidence, trust, and worship as such! May God raise up our younger generations in this same bold, faith-held, and worship-infused passion to advance forward with our God! Picking up on another Let the Nations Be Glad post, I wanted to include some of Piper's writings regarding prayer. Interestingly I read as Piper explained how prayer can often be too elevated above its intended role. Now, if you're like me and thinking, you may say, huh? Let me further explain. He continued to explain that prayer is often elevated in our emphasis on it over the Word of God. His basic point was that the Scriptures clearly elevate the Word as the supreme active agent in missions, with prayer as a necessary supportive tool. His point was simply that we can often emphasize prayer in a misinforming way that misdirects our prayers. The end result is a prayer focus that centers on peripheral things, and misses what is really to be at the core of our passion for God. Much of Piper's point centers on our misguided use of prayer. Do we approach prayer in a way that elevates our own selfish desires? Or, do we recognize the greater heart and mission of God (and therefore our mission), and then allow that to shape the way we pray? Furthermore, the Scriptures are packed with references upholding Scripture as the active agent, the sword of the Spirit in the offensive effort to live for God's purposes on this sin-racked earth (Acts 19:20; Romans 1:16, 10:17; Ephesians 6:17-18; James 1:18; 1 Peter 1:23). The Word of God and prayer go together; one exalted as the means to do God's work and the other upheld as a way of supporting the work of the Word. In John 17 and Acts 4:29 we read of the precedence of calling on God for boldness to speak His Word boldly. In 2 Thessalonians 3:1 we read of the prayer for God to amplify the working of the Word. In Colossians 4:3 Paul's prayer is for a door of open opportunity for the Word to work. In 1 Timothy 6:12 and 2 Timothy 4:7 we see life depicted as a fight or a war. Finally, in Ephesians 6 Paul speaks of this life-wartime context. He writes that we wrestle not against mere flesh and blood, but against cosmic powers of darkness. The offensive weapon Paul then lists in verse 17 for this war is the Sword of the Spirit, the Word of God. Then in the very next verse (18) we read the participle translated "so," directly connecting verse 18 on prayer to verse 17 regarding the Word's offensive work. 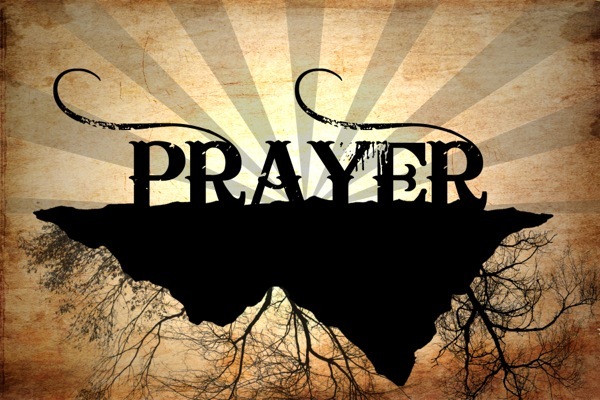 Thus, prayers are seen as a supportive catalyst to the offensive weapon of the Word. Do we pray in this way? Do we even view life in this New Testament depicted way? We do truly have so much to be thankful for, and a life lived with Jesus is indeed joyful. However, while we are promised God's faithful presence and joy lived in Him, we also see the Scriptures depict a life lived in Him as a struggle against the cosmic powers of darkness. No, I'm not getting all Star Wars on us. Seriously, the powers of Satan, sin, and our own flesh are a very real thing. It is these struggles that we wage war against while walking through life. Do we view Scripture as paramount in this life-battle? Do we view prayer as necessary to commune with our Commander for strength and victory from His Word in the battle? Here's my last thought… Are our prayers then shaped by this mentality? Think about it. How many times do I catch myself praying in a misguided way? How many times do I pray for someone to get better from some sickness or bad thing in their lives rather than pray for Jesus to do His work of refining in their lives. Regarding missions, how often do we pray just for safety and vague concerns for well-being? Oh, we can and should pray for healing and safety, but do we pray for spiritual growth as well? How often do we pray for God's Word to do it's intended offensive work in people's lives? These truths are surely convicting. It is my prayer to simply offer them here for you to likewise consider. Greetings! I just wanted to check in and share some stuff that I am really enjoying going through with the Koinonia group from our Let the Nations Be Glad study. The study itself finds it's roots in a principle inseparably connected to the Scriptures as a whole. However, Psalm 67 rings clear on the study's central premise. that your way may be known on earth, your saving power among all nations. Let the peoples praise you, O God; let all the peoples praise you! The earth has yielded its increase; God, our God, shall bless us. God shall bless us; let all the ends of the earth fear Him!" The totality of the Scriptures are resoundingly clear that our fundamental existence on planet earth is for the spread of our God's fame/glory. From the Old Testament way of dwelling amidst God's presence through the promised land and the sacrificial system to the New Testament's focus on Jesus' redemption, the centerpiece is the exaltation of God's great fame. The centerpiece of the Scriptures, really then, is worship. We are created for worship. Sin corrupts this. The Old Testament shows our gracious God's dealing with His people to point them back to His holiness through their faith in His redemptive provision through His law and sacrificial system. The New Testament (that which the entire Old Testament pointed toward) shows our gracious God's sovereignty and mind-boggling work of redeeming His own to Himself through faith in His provision in the form of Jesus. Missions therefore exists because worship does not. Missions must exist therefore, to beckon fallen humanity back to worship. This, of course, is a provision and work that only God can accomplish. We post-New-Testament humanity have the incredible privilege (along with people like the Ephesians in Eph. 1:10) of heralding the truly, infinitely good news of Jesus and the redemption His work offers. From texts like Ephesians 1:5-6, Romans 3:25, and 1 Peter 3:18, we see that Jesus' purpose was consumed with His zeal for the spread of the Father's glory. In John 11:1-6 we see a clear example of God's love and the exaltation of His glory. After hearing of Lazarus' imminent death, the text says that because of Jesus' love for His friends, He remained for the purpose of glorifying God. Do you see the connection to God's loving plan and the exalting of His glory? Oh, this all carries such profound implications for us today! Do we recognize that our God is truly worthy of worship? Do we truly realize that our God is on mission to spread His worship throughout the nations? Do we truly realize that our fundamental existence on planet earth is inseparably connected to this purpose? Are we truly enamored in worship of our great God? It is then precisely that enamored worship that should be the flame in our missiological outlook, passion, involvement, and prayer! I'm super amped (really, really excited) to launch a new study this Sunday in the Koinonia group! 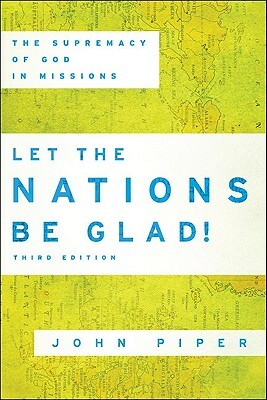 My attention is drawn to a book by John Piper, entitled, Let the Nations Be Glad. Piper's subtitle is "The Supremacy of God in Missions," but don't let the title and subtitle automatically shuffle this book into strictly a missions category. The Biblical truths in this book reveal God's desire and plan as central to the entire Biblical storyline and as central as the very reason we exist on planet earth. Therefore, the message of Let the Nations Be Glad extols our God's majesty and His supreme desire and plan to redeem His own from the nations to authentically redeemed worship of His Name. To be missional is the very reason we draw each breath and therefore encapsulates every aspect of our daily lives. The entire storyline of God's Revealed Word calls His followers to this God-glorifying among the nations purpose… from Exodus where God rescued His people to display His glory to the nations, to the countless Psalms where God's glory among the nations is extolled, to Isaiah where God created His people for His glory among the nations, to the Gospels in the New Testament where Jesus submitted to the Father's will to bring His glory to the nations, to Paul's epistles where the very plan of redemption serves to give God glory throughout the nations, to John's Revelation where we see the culmination of God's redeemed gathered from all nations for His glory. As we peer into Scripture's story, we see our great, majestic, Redeemer God full of truth and grace sovereignly reigning over the nations. We see this, our great God unfolding HIs plan for the nations. We see this, our great God redeeming a people from every tribe and tongue to Himself through Jesus. We see this, our great God actively setting things back to His original plan before sin. As we see this is fundamentally God's activity and plan in His Word, we begin to clearly deduce that our existence is fundamentally connected to it as well. Do you see it? This is so fundamental to our very existence! Think about it for a moment. Why to you exist on this earth? If it is true that we indeed exist for the sole purpose of worshiping our great God and spreading His fame and plan of redemption, how are living up to it? Are we passionate about or worship of God? Are we passionate about missions. I'm not talking about the missions that subdivides a certain aspect of the church to "missions." While we as the church are to have a missions program, we more deeply drastically need to see our calling to be missional as fundamental to our very existence! This goes far deeper and carries drastically wider implications than just for full-time ministry workers and missionaries. Whatever our calling in life, we are inseparably called to redeemed worship of our great God and the spreading of this through living missionally in this world. If you're like me and tracking with all this up to this point, you'd respond with a resounding, "gulp" or "wow!" This is quite the calling! It is something that continues to deeply uproot previous missiological assumptions and those ever present seasons of apathy in my own life. How are we doing living up to our fundamental purpose on this earth? How are you engaging the nations as part of this calling? This is the study that I am extremely amped to launch this Sunday in the Koinonia Sunday school. If you're interested in getting a copy of Piper's book for yourself, check it out! Note, I will probably occasionally blog and/or share related resources about it as we go through the study in the coming weeks. Look for more content on the blog and the church app! The other day I was sitting at Kaladi Brothers enjoying some studying time with a coconut mocha frappe. As I sit it any coffee shop, it is quite interesting to observe this cultural epicenter of our society. Culture in general fascinates me and it is likely one of the interests that God gave me for mission work. As believers we are called to live in this world for the spread of Jesus’ fame. We are called to be in the world, but not to live for the world. Right? Question…How are we to influence this world for the spread of Jesus’ fame? As you look through Scripture, we read about Jesus’ highly relational attention to people. We see Jesus living in the culture of that day and confronting it with the truth of His Father. We also read about Paul’s sensitivity to the differing cultural worlds surrounding him throughout each town he traveled. As we further read and examine the Scriptural letters in the New Testament, we see a redeemed people living in a real world, wrestling with the same issue we wrestle with today: living in our world/culture for the spread of Jesus’ fame in an effective and yet holy way. One helpful paradigm I stumbled across a couple years ago goes like this: 1. Receive 2. Reject 3. Redeem. As we peer at culture and our responsibility to live in it as redeemed mankind fashioned in God’s now sanctifying image, how do we flesh this out in a Jesus-honoring and balanced way? This 3-point paradigm I believe helps in this process. Like Jesus, Paul, the other apostles, and the early church, we must develop a God-centered lens from which we peer at our cultural world. There are always aspects of culture that we can receive, enjoy, and adapt. Although apart from God’s provision we are utterly marred in sin, humanity’s God-given expressions of culture have beautiful traces of our Creator. We must learn to develop eyes to see these visible traces of God’s creation reflected in culture. Likewise, there will inevitably be many aspects of culture that are evidences of humanity’s depravity. These must obviously be rejected. God has chosen, called, and saved us out of this deprave world to live as salt and light. There are many examples of even believers who wrongly contextualize their lives and the Gospel in culturally compromised ways. Finally, these rejected aspects of fallen culture must ultimately be pointed toward redemption. Every deprave and rejected aspect of culture can be pointed toward redemption in light of Jesus and the Gospel’s implications for us His people, the church. So my question, How are you looking at our world, our culture? How are you receiving and adapting to some aspects of culture? Are you properly discerning in this area? How are you rejecting aspects of culture? Are you properly discerned in this area? Have you compromised in this area? How are you pointing toward the cross, toward redemption, in our fallen world? Do you recognize this as part of your calling as a Christian? As I sit in a coffee shop, I am observing culture. Coffee shops really are incredible epicenters in our cultural world today, at least in Western America (though I think it probably extends beyond just here). By studying in this environment occasionally, I get to see the continual flow of all kinds of people on their morning routine. Another observation... coffee shops are places where people love to hang out to study (like me) or places that simply foster a great environment for hanging out with friends. This is an interesting aspect of culture. Similarly, many movie theaters reveal similar observations about culture. We could undoubtedly make many good and bad observations about culture from observing a typical movie theater. Another obvious aspect to culture and values is observed in dress styles and how people choose to portray themselves in public. What does this tell you about some potentially good or bad observations of our culture? Take any of these simple examples and apply them to numerous other scenarios…the grocery store, the home improvement store, any random restaurant, the outdoors (fishing, hunting), etc… What aspects of culture do you see from these different places? Think for a moment about television. There are many aspects, good and bad, that we can observe from television, movies, and media in general. What kind of cultural agenda does today’s television and movies try to push? What are some good and bad observations we could make about our media? Music is another great example. What type of music does our culture uphold as “accepted?” Why is that? What kind of lyrics are used in today’s music? What topics are referred to in music today? What are some good and bad observations we could draw out from music in our culture? Maybe somewhat related to some other examples previously listed above, what type of places and times of the day do people gather for fun? Why do cities have such a big focus on nightlife? What age group of people are found hanging out together and when and where do they hang out? Why is that? What observations could we make? And our examples could continue indefinitely! As we learn to look at culture with attentive lenses filtered by the Gospel, we will begin seeing culture as a gift from our Creator God, but something also in dire need of redemption! How do you look at the culture around you? What are aspects of culture right now that you are enjoying? What are aspects right now that you are rejecting? How then are you seeking to point toward redemption in those rejected aspects of our marred culture? These are I believe important Biblical principles for us to implement. As I stated, I have found this 3-point paradigm particularly helpful. It’s so easy to roll through life, either living in our own little world, missing opportunities to reach our culture for Jesus, or sometimes even living in culturally compromised ways. May we learn to develop Jesus-centered cultural lenses as we seek to live for the spread of His fame in our world!